The X-Files will return to FOX in January with David Duchovny and Gillian Anderson bringing back Fox Mulder and Dana Scully. 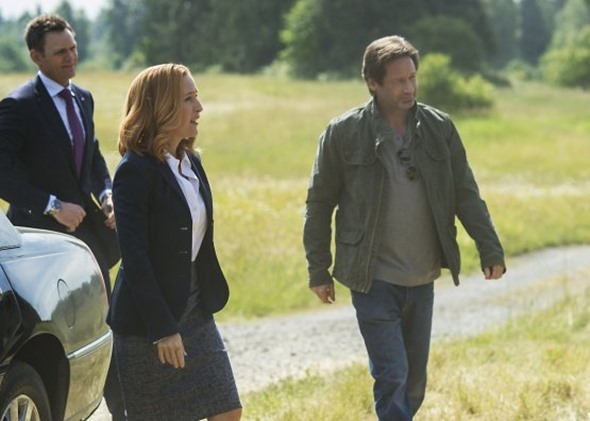 However, there is the possibility of a new X-Files series after the revival wraps. An idea for spin-off featuring a new duo of FBI agents was bounced around at the network. Robbie Amell and Lauren Ambrose appear on the revival as FBI agents that have taken on the cases Mulder and Scully used to investigate. TV Line reported on the potential spin-off, and the idea has not yet taken hold at FOX. That does not mean that a spin-off will never happen. If the revival is a hit and fans like the new duo, FOX could change their minds and move forward with the new series. For now, fans can focus on the revival which will air a two-night premiere on January 24 and 25 next year. Would you want a new duo to bring The X-Files back to life? Would you watch an X-Files series that did not involve Duchovny and Anderson? Tell us what you think. I can’t wait for the X-files William spin-off TV series to air in a couple of years. There’s a new Facebook group now called ” William: The X-files spin-off series ” if you wanna join it. David Duchovny said the X-files spin-off series will be similar to the 80’s TV show Highway to Heaven. In the show William will be helping people in need, when traveling from place to place and using his powers. I would watch any new X Files spin off, but they must remember seasons 8 & 9 were it was only duchovny that was absent. I loved the original cast, too – no one like Mulder and Scully! But, I’ll take a new cast just to get the show back. The number of shows that I actually like on tv are very few. I hate reality shows, so I’ll take what I can get. Absolutely NOT. The X-Files belongs to Mulder and Scully and only them. Would you want to see any other characters but Archie & Edith play in All in the Family?? No Mulder or Scully? Hmph… I loved the original show/cast… Getting a new cast NEVER WORKS. I loved the original series. Don’t know about new agents, I guess it would depend on if they are any good at it. If it means the series will continue? Yes! …… I too am a believer. You cannot replace anyone, they have to stand on their own. Imagine if people had this sentiment when X-Files first ran. There would be no X-Files. Give the show a chance. The people behind the X-Files have already learned the lesson from the last two seasons of the original run that the X-Files IS Mulder and Scully. I’ll gladly watch any number of limited-run series with our heroes. A new series? No way. I would love to see a new X-Files! Anything is an improvement. Especially since I’m still angry about the cancelling of Haven. It would give me something to look forward to.